Good anchor techniques are crucial for safety. You wouldn’t want to wake up one night only to find the wind blowing hard and dragging your sailboat and its anchor towards the shore, another boat, or towards the rocks. If you are just getting started with sailing, chances are, you may not know how to anchor a boat. Learning and understanding the essentials is crucial. Just tossing the anchor overboard and then assuming that everything will be fine is never a good idea. In most conditions, anchoring a sailboat securely and correctly shouldn’t be too tough. 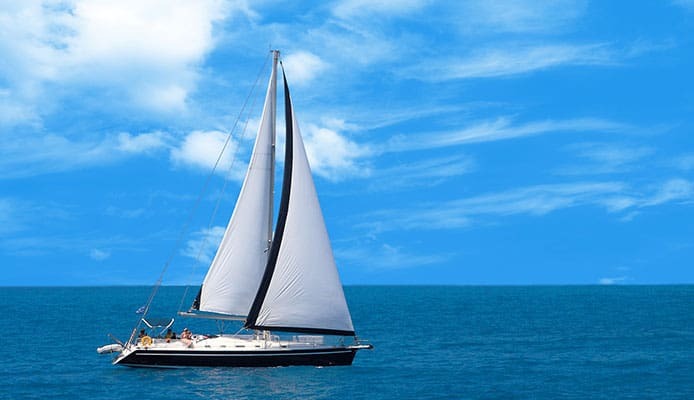 The guidelines outlined in this article will help you anchor your sailboat safely so that you can enjoy a good night’s sleep. To succeed at anchoring your sailboat correctly, you need to invest in the right anchoring equipment. In this section, we will help you select the best sailing anchor, deck cleats (anchor rollers), nylon anchor line, and anchor chain. A fluke anchor relies more on its design and less on its weight. Its design consists of 2 flat, pointed flukes which extend at a 30 degrees angle from the rod. The fluke anchor has more staying power by weight in both hard sand and soft mud. The anchor’s broad-fluked design can keep it from reaching the bottom if you are in a strong current. Similar to most anchors, it will have issues catching on hard bottoms. If after rigging your sailboat you intend to explore areas with high or changing current, investing in a plow anchor may be a good idea. This type of anchor features a plow-shaped wedge attached to the shaft by a swivel. When compared to other lightweight anchors, plow anchors are more effective in both grass and soft bottoms. Plow anchors are heavier than the fluke anchors. For this reason, they set more easily. They, however, have less holding power when compared to the fluke anchors. The shaft has the ability to swivel in the direction towards which it is pulled without yanking the sailboat’s main anchor. This makes it less likely to unfasten when your boat gets pulled in a different direction. These types of anchors are only ideal for light use only. They resemble a dish or a disc at the base of the shaft. Mushroom anchors do lack holding power. 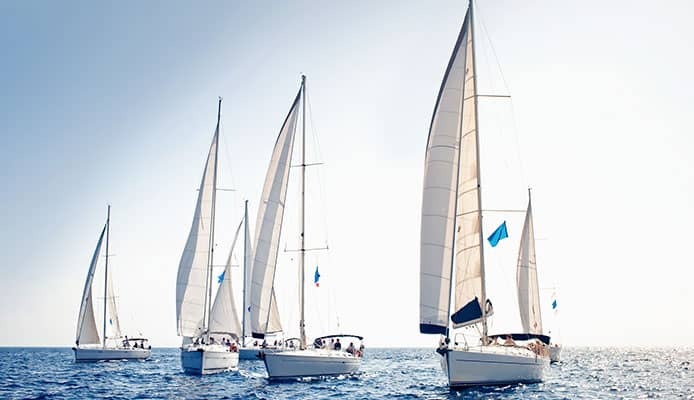 However, they are ideal for small sailboats which make short stops in areas which feature soft ground. Mushroom anchors are ideal for heavily weeded areas. Also, if you would like to avoid poking holes in types of boats which have thin hulls, the anchor may be an ideal choice for you. Chances are, whenever you put on your sailing shoes and decide to head out to the sea, you may have to make stops in different spots and in varying conditions. Having different anchors which are ideal for the varying conditions and anchoring spots may be a good idea. For example, you will need to deploy a larger anchor for overnight stops or rough weather. For short breaks and maybe lunch stops, you may need a smaller anchor. After the anchor has penetrated the seabed surface, suction will generate resistance. The bottom material and the weight of the material above the sailboat anchor helps create the resistance. As the sailboat pulls on the anchor node, the anchor ends up digging deeper and hence creating more resistance. In coral or rocky bottoms, anchors snag on the seabed’s protrusions and hold precariously since they can’t dig in. Before taking your marine GPS and starting your sailing trip, you should ensure that you have an anchor roller on your boat. You should also make sure that you have strong and sturdy deck cleats on your boat to tie the anchor rope onto. To ensure that you do not have issues when raising your anchor, you should also consider investing in the best sailboat winches. The rope, chain, or a combination of both is generally referred to as the anchor rode. Nylon features elasticity which allows it to respond extremely well to sudden current and wind changes. A high-quality rope should be strong enough to be used as a rode. If you decide to use a chain as a rode, you have to understand that it may require more effort. It may also be more expensive. However, it will ensure that the anchor drops to the bottom quickly and it won’t be fouled by strong currents. When purchasing a chain, look for one that features consistent galvanization and high-quality manufacture. You can also decide to use a combination of the rope and the chain as the rode. You will, however, require a shackle joint to ensure that the 2 lengths are fastened tightly. The right nylon rope diameter for a 3-meter craft is 4.8 mm and 9.5 mm for a craft whose length does not exceed 6 meters. For each additional 3 meters to the craft length, increase the diameter by 3.2 mm. The chain diameter can be 3.2 mm smaller than the rope diameter for the respective boat size. Your charts should help you determine the depth. You should try to find a location that features a flat bottom suitable for the anchor type you have. You should avoid areas which feature strong currents. Also, avoid spots which are open to the weather, especially if you are done with wearing your sailing pants and shorts for the day and you intend to anchor the boat overnight. Measure the spot’s depth and then multiply it by 7. This is roughly how far your sailboat is expected to drift from the anchor. If the wind/current happens to change, your boat may swing to the other side of the anchor. For this reason, you should make sure that enough space is available in all directions. Circle your select spot while taking depth measurements. This will help you determine whether the area has any hidden shoals which could damage the boat if it happens to drift after you anchor it. Checking both the tide and weather information can help improve boating safety even after anchoring your craft. Knowing the timing of the next tide will help you avoid getting caught unawares. If you intend to take more than an hour or two before raising your anchor and putting on your sailing gloves, you should check the weather forecast so that you are prepared for storms and high winds. For anchor techniques to be effective, you need to approach your chosen spot from downwind. Stop your sailboat when you are over it. When you stop, the wind or current should push you back slowly away from the spot, this is the ideal time to drop your anchor. If the window is pushing you back too quickly, you may consider reefing the sailboat. Before using any of the anchoring techniques you are familiar with, you need to determine how much rode you will need and then use a cleat hitch to tie the rode at the selected distance. To determine how much rode you need, you have to be familiar with the term scope. Simply defined, scope refers to the ratio between the rode length and the distance from the bottom to the bow. For a rope rode, the ideal scope should be at least 7:1. You can use a scope of 5:1 for a chain rode. For stormy conditions, you can increase the scope to over 10:1. As you increase the scope, the rode moves closer to horizontal. This increases the anchoring tightness. Ensure that you measure the bow and not the water surface. If the water is 3 meters deep (10 feet), and your bow is 1.2 meters (4 feet) above the water surface, then the total depth should be 4.2 meters (14 feet). Using the typical scope of 7:1, you would need 4.2 x 7 = 29.4 meters of rode (14 x 7 = 98 feet of rode). Ensure the rode is tight at first. This will make it easier for you to aim the anchor until it hits the bottom. Next, play out the rode at the same speed as the sailboat. The rope is supposed to end up in a straight line across the bottom. It shouldn’t be piled up in a heap that could end up getting tangled. After you have let out a third of the rode length you had determined you would need, cinch the rode off and allow the sailboat to straighten it out. The boat should straighten the anchor rode and set the anchor to the bottom. Uncinch the rode and play out two-thirds of the rode length. Next, allow the sailboat’s momentum to straighten the length out. Repeat this process once more, letting out the remaining rode length. After you tie off the line, give it a tug to ensure that the anchor has already set. If the anchor did not set, you may need to find a better spot with better conditions. In tight anchorages, it is often necessary to limit the sailboat’s capability to swing at the anchor. You can limit the swinging by dropping one anchor on the bow and another on the stern. You can use the tension on one rode to set the 2 anchors. If you are new to sailing, one of the sailing tips you may not know is that you can actually drop 2 anchors from the bow. You should set one anchor into the current or wind and the second one 180 degrees away. This will ensure that the sailboat swings around in a small arc. It will also ensure that the sailboat does not dislodge the already set anchor. If the chart plotter already has an anchor alarm, it can alert you if your boat happens to swing too far from the position where you had set the anchor. If among the best gifts for sailors you received an electronic compass was included, you can set the course alarm so that it alerts you if the boat’s heading happens to change. Stand an anchor watch. Taking a bearing on the prominent landmarks after anchoring your sailboat can help you detect subsequent position change. If you do have alarms on the depth sounder, you can set minimum and maximum alarms to alert you if the depth happens to change significantly. This can let you know when the boat is drifting away from the shore or towards the shore. If you need to take a break from sailing, you have to anchor your sailboat. If you do not know how to anchor a boat, taking breaks may become impossible. This article shows you the top anchor techniques you can use. Knowing how to choose the right anchoring equipment is as essential as knowing how to anchor a boat. Without the right equipment, you may not succeed at anchoring your sailboat securely. Since different seabeds and conditions will require different anchoring equipment, ensure you use the right equipment.